The Selective Service Act of 1948 was the basis of the United States’ modern draft system, used in both the Korean and Vietnam conflicts. All males between the ages of 19 and 26 were eligible and were required to serve at least 21 months in the Armed Forces if they were chosen. In 1951, these requirements were adjusted to meet the demands of the Korean War. The draft age was lowered to 18 and a half; active-duty service was increased from 21 months to 24. College students were exempt, but only as long as they were in school. President Kennedy later signed an executive order exempting all married men between the ages of 19 and 26, but this was later revised by an order from President Johnson. Halfway through the Vietnam conflict in 1967, the conscription ages were expanded to the ages of 18 to 35. Student exemptions were still granted, but ended as soon as either the candidate’s four-year degree was completed or his 24th birthday. President Nixon signed an amendment into law in 1969 that established conscription based on random selection. There were a total of four lottery drawings between 1969 and 1972. Additionally, a stipulation was added in 1971 to make registration compulsory; all males had to register almost immediately before or after their 18th birthday. President Ford’s own son Steven Ford had failed to register, although the press at the time never discovered this. Later, in an interview with Richard Norton Smith, Steven Ford claims that he simply forgot and had to go and register as soon as the President knew to avoid a “terrible press situation.” (A transcript of this interview can be found here; Ford discusses the draft beginning with “Whew, there wasn’t much applause at that speech.”) In 1975, President Ford ended the requirement for registration of males 18 to 25. > Draft Resisters openly refuse service and are willing to accept the consequences of their actions. Most often, this was imprisonment. Resisters are the best remembered response to the S.S.A. – “Hell no, we won’t go!” and similar slogans decorated signs and buttons at their many demonstrations. The S.S.A. required men to be in possession of their draft cards at all times, which is why burning one’s card was such a popular act of noncooperation. Before 1965, a registrant burning a draft card would immediately be reclassified 1-A (eligible for active-duty military service) and sent an induction order. If the registrant refused induction, that would mean prosecution. 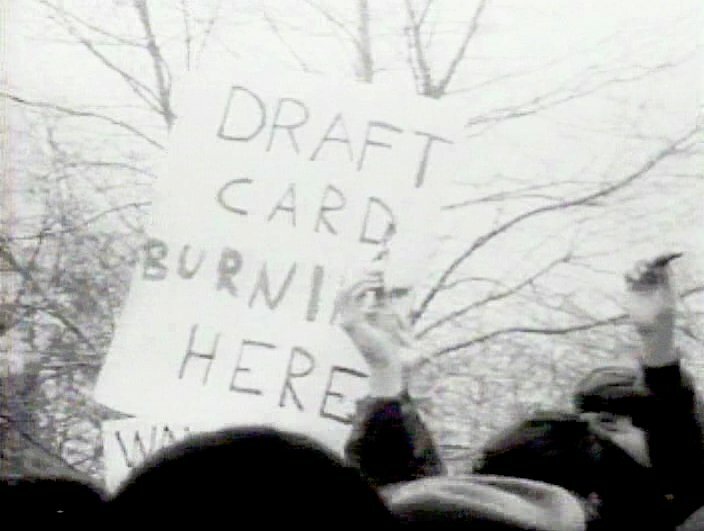 After 1965, the act of burning a draft card was listed as a felony and was punishable by five years’ imprisonment. Nearly 730 draft resisters were in federal prison in December of 1968. > Draft Evaders keep their refusal private, and are not willing to accept legal consequences. These are men who quietly move out of the country or even self-mutilate to avoid service, although they were always given the option to register late without penalty. A rather famous example, Jimi Hendrix can be categorized as a draft evader. Initially, he claimed that a parachuting accident had left him injured and thus unfit for active duty, but biographer Charles R. Cross claims differently. While writing his 2005 Room Full of Mirrors: A Biography of Jimi Hendrix Cross had access to Hendrix’s medical records, which state that the musician in question had homosexual tendencies. Cross claims that this was a lie crafted to avoid service. > Conscientious Objectors fit into neither of the above categories. Prior to 1965, this designation was only reserved for those whose religion included pacifism as a belief. C.O.s would still register as required, but were assigned either noncombatant military service (designation 1-AO, most often serving in the medical corps) or alternative service (designation 1-O, working in industries necessary for the war effort such as manufacturing). Traditionally conscientious objectors were members of the peace churches, such as the Church of the Brethren or the Society of Friends. The 1965 court case Seeger v. United States decided that a C.O. did not need to believe in God in order to qualify; this policy was expanded to include non-religious, purely ethical belief as a result of Welsh v. United States (1970). Military Selective Service, §§ 49-3801-3820 (1948). “Steve Ford.” Interview by Richard Norton Smith. Gerald R. Ford Oral History Project. March 7, 2011. http://geraldrfordfoundation.org/centennial/oralhistory/steve-ford/. Young, Nigel J., ed. “Draft Refusal in the United States.” The Oxford International Encyclopedia of Peace. 2010. Photo: Young men burn their draft cards in New York City on April 15, 1967, at Sheep Meadow, Central Park. Public Domain.